Every year, in addition to marinara, I make oven-roasted tomato paste to preserve my harvest. This year I also decided to try my friend Denise’s Balsamic Tomato Jam. 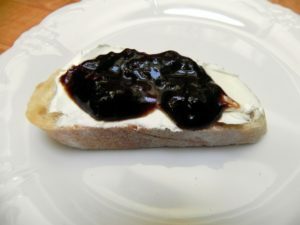 I serve this spicy, sweet and savory spread on a slice of chewy bread with a shmear of chevre cheese or cream cheese. 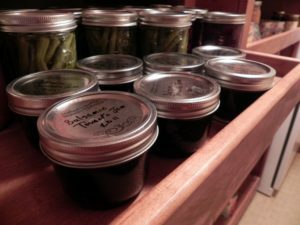 Six pounds of tomatoes yielded 7 half-pint jars of jam, two of which have already flown out the door. Here’s Denise’s recipe for 1 ½ pounds of tomatoes. Combine the allspice, cloves, red pepper flakes & mustard seeds in a piece of cheese cloth and tie securely with kitchen string to form a spice bag. Scald tomatoes. When skins split plunge in cold water to stop the cooking and peel. I used a variety of heirloom, slicer and salad tomatoes. 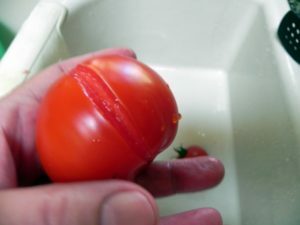 Remove tough stem area in center of fruit, slice and dice. 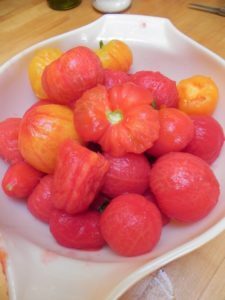 Place the tomatoes and all remaining ingredients in a heavy saucepan. Add the spice bag, with the string hanging out of the pan. Slowly bring to a boil, then reduce heat and simmer for 30 minutes (or until reduced to 1-1/4 cup). Stir frequently. Remove from heat, cool and refrigerate (or pack boiling jam in sterilized jars to preserve). NOTE: If you multiply this recipe you will need longer cooking time to reduce the jam and should remove the spice bag after 30 minutes. Jam joins the other preserved goodies in the pantry. 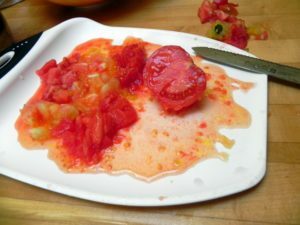 I add small amounts of this concentrated, slightly caramelized tomato paste to soups and sauces, or chop it finely as a spread for bruschetta. 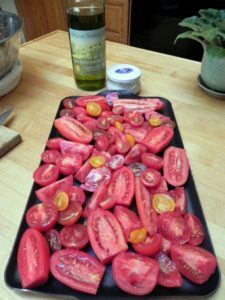 Five pounds of tomatoes halved and spread in a single layer, drizzled with plenty of extra virgin olive oil and sprinkled with sea salt. Roast about 3 hours in 300 degree oven until dried. 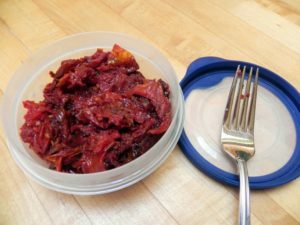 Five pounds of tomatoes yielded less than 1 cup of roasted tomato paste, but it is so intensely flavored that it goes a long way and can be frozen in small bags or containers.